The American Heart Association and the American College of Cardiology have released new guidelines for the management of elevated blood cholesterol levels. These guidelines focus on LDL-cholesterol. They are summarized in the figure below which can be enlarged by clicking on it. They were published in a short article in the JAMA which is appended below. The intent of these recommendations is prevent a first episode or a recurrence of a cardiovascular event. And in high risk patients the treatment outlined in these guidelines likely achieves its purpose. But they are too vague as described below. 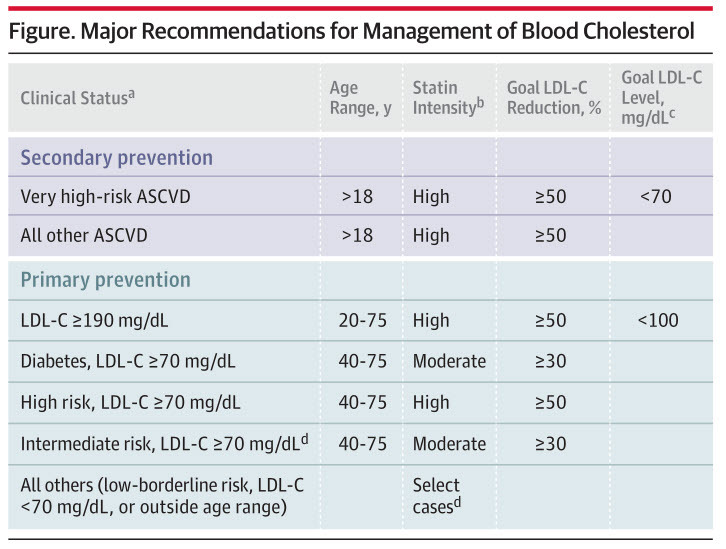 The problem with these guidelines is the patient whose LDL-C is above 190, but who does not have any other risk factor for cardiovascular disease. The guidelines call for intensive treatment is such a patient, though there is no evidence that such a patient will benefit from such treatment. While the authors of these guidelines write about patients with intermediate or high risks for CVD, they say not a word about the low risk patient. Clinicians are left hanging about these patients. They must remember that guidelines are just that – guidelines, not rules or laws. Good clinical judgement must prevail not matter how murky the clinical situation may be.